Tecbond hot melt adhesives provide instant, permanent bonding on a vast range of materials without the use of harmful solvents. They are ideal for fast repetitive gluing applications. Our hot melts are available in stick or cartridge form which are easily loaded into hand-held glue guns. The solid adhesive is pushed into a heated chamber where it melts, and can be extruded from the nozzle by gently squeezing the trigger. Most materials can be bonded with hot melt adhesives providing the parts can be assembled while the adhesive is still molten. The molten adhesive is applied to one of the surfaces to be bonded. When the parts are pressed together the heat quickly dissipates into the substrates, which solidifies the adhesive, and a bond or seal is made instantly. Working times of our hot melts vary from just a few seconds to several minutes: the actual time will depend on adhesive formulation, ambient temperature, substrate temperature, and the amount and configuration of the adhesive applied. Tecbond hot melts are 100% solid, non-toxic adhesives containing no solvents (no VOCs) or water. Users do not have to worry about odours or mould in finished products, or about paying for a solvent that just evaporates. 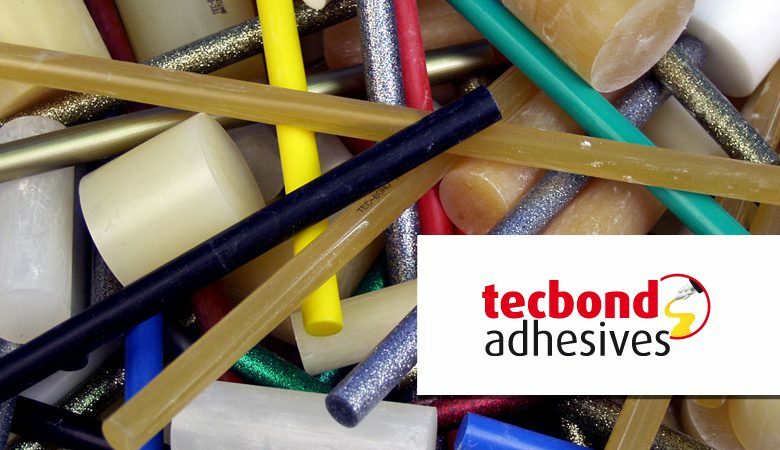 Tecbond hot melt adhesives are safe and easy to store, and have a virtually unlimited shelf life.